Team AMT Quad Cities showed up to support EMT Adrian Moreno during his swearing in as a Rock Island County Sheriff’s Deputy. We appreciate this young man and his heart to serve. Photo courtesy of Justin Ploog. Peace on Earth, and good will to all. 🌲♥️⛄️🚑 Please be well and be safe and have a wonderful holiday season. - your #TeamAMT friends and family Photo courtesy of Chesney Owenby. Much respect to Cpl. Daniel Baker, and our sincerest condolences to his family and friends. Photos courtesy of Kaitlyn Davis. We could not be any prouder of our Creighton University/AMT EMS Academy Paramedic students and EMT students who graduated tonight. Please tag yourselves and your friends in these photos and congratulations to every one of you. To give you an idea of the accomplishment - our five Paramedic students logged 568 classroom hours, 2,731 field internship hours, and took 16,780 vital signs on 1,143 patients. Wow! Big congratulations to our Customer Service Department for keeping the holiday spirit of caring and sharing! Our Pekin crews were able to collect over 100 food items for the Pekin Township pantry. They partnered with the Pekin Police Department to help make the holidays a little brighter for some residents in Pekin. All our hearts go out to Tremont Rescue 702 and Daniel Baker's family and friends. On Saturday many of Pekin's police officers, firefighters, and AMT personnel joined children for a shopping spree at Big R. Many local businesses donated money so that each child could get all the toys they wanted with $100. Matt Sheehan TV has the full story. Diapers are expensive, and money is tight during the holidays. So we are thrilled to support Ryan Spain’s Diaper Drive once again this year. Special thanks go to our friends at Hy-Vee who helped us out. We are already looking forward to an even bigger presence at next year's Career Spark event. How many of you were among the 4,200 who visited? What an amazing day! So this happened... Two ambulances from Advanced Medical Transport pulled in to our parking lot and before we knew it a gurney LOADED with donations was being wheeled in to our front door! We are truly humbled by the generosity of the staff at Advanced Medical Transport. Thank you so much for the awesome donation. From our family to yours - Happy Thanksgiving everyone! We are thankful for the opportunity to serve you. Support a great cause in the Pekin area! Meet just some of our QC super heroes! From left to right...Lori Maynard, Brittini Kinzer, Tiffany Handley, Todd Fusco, Mike Walz, Jacob Powell and Kayla Barry. Photo courtesy of Pam Westfall. Thank you to the men and women of the United States Armed Forces for your sacrifice and commitment. We salute you! Congratulations, John! It's a well-deserved honor. AMT’s Helping Hearts employee volunteer group delivers pet supplies to Amanda at PCAP PAWS today. The group collected donations during October. Photo courtesy of Jenny Fleming. We love working with local Girl Scouts and Boy Scouts to help them earn first aid badges. This group from Concordia Lutheran did great on their skills! Photos courtesy of Clarissa and Chesney. How is your fall going? We are enjoying the beauty nature provides. Photo courtesy of Anna Nofsinger. Standing by to keep our fellow responders in Hanna City safe. Photo courtesy of Colleen Haag. It was a great day in the Village of Peoria Heights for their Hocus Pocus event! We are thankful to be a part of this proud community. Some photos courtesy of Lauren and Chesney. The Pekin Police Department would like to thank Advanced Medical Transport for opening a new facility last year in the heart of Pekin. The new facility was built at 1230 Park Av, right across from Unity Point. 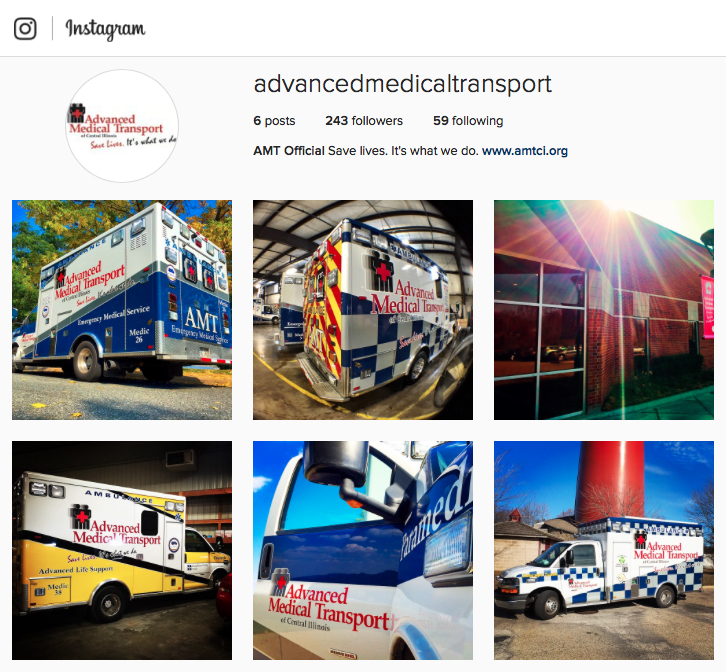 Congratulations AMT on your 1 year Anniversary! Career Spark Day 2 and 1,900 more students expected. We are ready! Day one of Career Spark has been a great success! Thank you to our friends at Tailgate N' Tallboys, who continue to bring exciting events and high quality entertainment to Peoria! This great community event is just getting underway! Our crew had a wonderful time at the PDC Picnic. Photos courtesy of Evan Ineichen. We were fortunate enough to meet about 250 new (and old) friends at the Wheels O' Time Museum this weekend. Photos courtesy of Bobbie Rice. Our teammate Schuyler was recently honored at the Special Olympics Illinois banquet for the District G Basketball Tournament. We join our fellow emergency workers in Tazewell County in paying respect to this loyal public servant.